» How Fruitful is Your Soul Garden? In this parable, Jesus said that the Kingdom of God is like someone scattering seed on the ground. As time passes, the seed sprouts and grows. Life comes from the seed. The nutrients needed to sustain that life comes from the soil. The plant grows and produces fruit through the combination of good seed planted on good soil. In this illustration of the Kingdom of God, the only part we play as sowers is to scatter the seed of God’s Word. The life giving power is in the seed (the Word of God) itself. But as Jesus taught in the 4-soils parable (Mt. 13:3-23; Mk. 4:3-20; Lk. 8:5-15), the condition of the soil is critical in determining whether the seed will take root, grow, and bear fruit. If the soil is too hard, dry, or shallow, the seed cannot take root and grow. Seed scattered in weedy soil may take root, but it will not be healthy and produce fruit. Only properly prepared soil is productive. There is no point in scattering more and more seed on the same unprepared ground. A good gardener first prepares the soil by tilling it, fertilizing it, and watering it, etc. Just as a good shepherd loves the sheep and gives his life for them (Jn. 10:11), a good gardener loves their garden. The good gardener loves their garden enough to sacrifice for the plants. They will invest time, money, and effort into their garden, doing all they can to encourage their seeds to sprout and grow, and their plants to thrive and be fruitful. 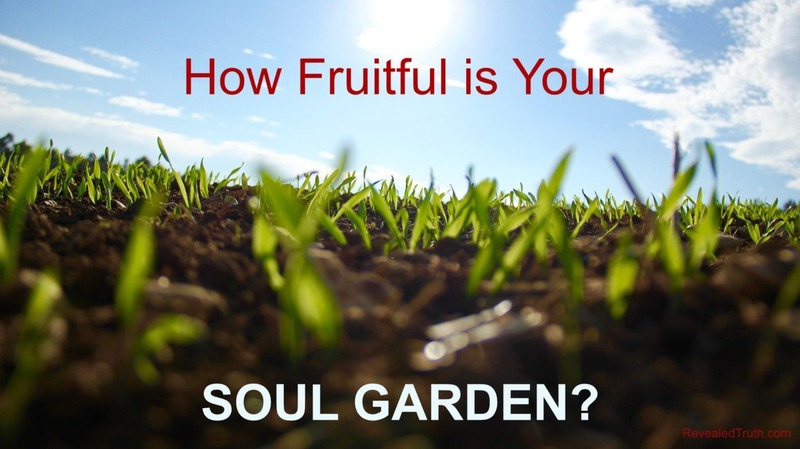 Do You Have a Soul Garden? Those truly interested in winning souls to God must do more than just scatter seed. They must love the lost (despite their sin). One problem in our modern age is that the lost seem to think that conservative Christians hate them (rather than just their sin). We must be careful how we present our message and live our lives, so they will understand that we love them while not condoning their sin. At the same time, we need to maintain a good, uncompromising Christian testimony. We are called to be salt (Mt. 5:13a). As salt, we must remain pure and holy or we are good for nothing (Mt. 5:13b). We need to live in such a way that the lost see our good works, which will bring glory to our Father in heaven (Mt.5:16). In other words, we must be Christ-like in all our ways. Jesus was criticized by the religious leaders of His day for fellowshipping and spending time with the lost. When questioned why He ate and drank with sinners, Jesus said that it is the sick, not the healthy, that need a physician. He came to call sinners to repentance (Mt. 9:10-13; Mk. 2:15-17; Lk 5:29-32). Jesus came to seek and save those who are lost (Lk. 19:10). Jesus spent time with the lost. He healed them, fed them, and taught them the true meaning of God’s Word. He forgave sins, but never overlooked or condoned sin. Nor did He ever sin Himself. Jesus did not try to make people feel good about their sin. Jesus called sinners to repentance and faith in God. He told them to “Go and sin NO more” (Jn. 5:14; 8:11). “Friendship Evangelism” tends to miss the mark by focusing exclusively on the friendship and love aspects of soil preparation. But preparing the soil is not enough. People need to hear the gospel, because faith comes by hearing the Word of God (Rom. 10:17). Unless the proper seed is sown, well prepared soil will just grow healthy weeds. If we are not careful, Satan will plant tares in the soil we prepare (Mt. 13:24-30; 36-43) producing counterfeit Christians or cults. So by all means, preach the Word (Rom. 10:8-10; 2 Tim. 4:2). Unless the proper seed is sown, well prepared soil will just grow healthy weeds. We are called to be “the light of the world” (Mt. 5:14-15). Jesus calls us to let our light so shine that people will see our good works, and glorify our Father in heaven (Mt. 5:16). We should be Bible epistles, “known and read of all men” (2 Cor. 3:2). So as we go about our lives, we should freely scatter gospel seeds. Everyone needs the gospel and we never know whose heart is already ready to receive God’s lifesaving message. In addition to freely broadcasting the Word of God everywhere we go, all Christians should maintain their own personal soul garden. Your soul garden is made up of friends, relatives, neighbors, coworkers and others with whom you regularly come into contact. We need to love, care, and be friendly to them to prepare their hearts to receive the gospel. In addition to freely broadcasting the Word of God everywhere we go, all Christians should maintain their own personal soul garden. To maximize our fruitfulness as soul farmers, we need to both prepare the soil and plant the seed. So keep on scattering the seed, and remember to prepare the soil by loving the lost. Keep on preparing hearts to receive the gospel by befriending them, and remember to plant the seed of God’s Word. One final point should be made. Jesus ended this parable saying, “But when the fruit is brought forth, immediately he putteth in the sickle, because the harvest is come” (Mk. 4:29). Many a sale has been lost because the salesman never asked the prospective customer to make the purchase. Don’t be afraid. Ask for the sale! Many a fish has been lost because the fisherman failed to set the hook. Set the hook and start reeling! When a soul, whose heart you have been preparing, is ready to bear fruit, plant the seed! Share the gospel with them. Invite them into the Kingdom of God. Ask them to make the decision to trust Jesus Christ as their personal savior! Previous Post The Contamination Triangle Next Post 1 Peter 3:15 – Are You Ready to Answer Evolutionists?